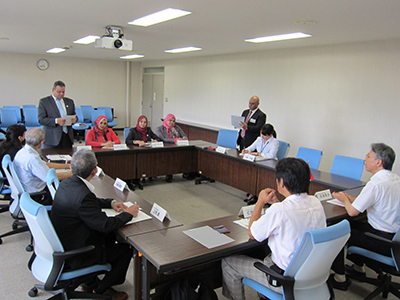 In the schedule of August 24 to September 11,JICA Hokuriku-Kanazawa University Issue-Specific Training Course, “Educational Administration, Financial System and School Management for Expansion of Basic Education in Middle East” has started. On August 24, 4 officers of educational departments from Egypt participated in the Opening Ceremony held at the Kakuma Campus, followed by a courtesy visit to Vice President Otani (International Affairs). During this training course, and with Kanazawa University as the base,they plan to make interaction through observation of elementary and middle schools and other facilities with cooperation from the Educational Committee of Ishikawa, Kanazawa City, Hakusan City, etc. The participants are expected to make use of their experiences in Japan under this course, and take part in the improvement of school management in their own countries.